KEY FEATURES: Lily to 60cm with long arching 'leaves' and erect blue and white flowers. 'LEAVES' basal, long-tapering, to 100x3cm, green. 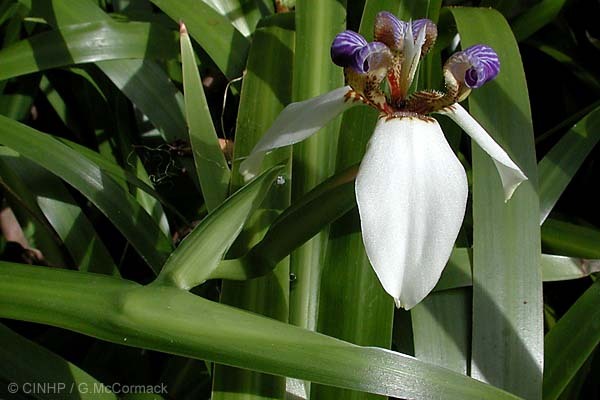 FLOWERS on short stalks from a fold on a 'leaf'; each short-lived, to 6cmØ, stigma 3-pronged; outer petals 3 spreading (=tepals) white; inner petals 3, rolled-back, dark blue and white; petal bases yellow with brown markings. SIMILAR SPECIES: Apostle Plant (Neomarica northiana) - possibly present) has larger flowers 7cmØ (vs 5cm), and stigma with 2 prongs (vs 3). IDENTIFICATION: Lily to 60cm with arching 'leaves'. 'LEAVES' (=flower-stalk plus terminal leaf) sword-like, erect or reclining, to 100x3cm. FLOWERS on short stems arising from 'leaf'; short-lived, to 6cmØ, stigma 3-pronged; PETALS outer 3, oval, tips acute, white; inner 3, recurved, deep blue and white; all bases variegated.